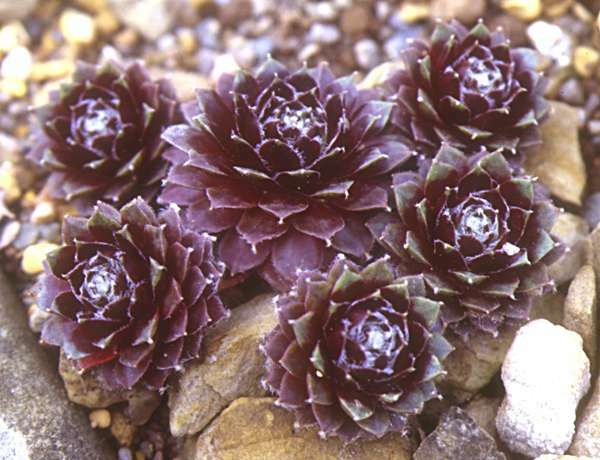 Sempervivum: a genus of hardy monocarpic alpine succulents in the family Crassulaceae. 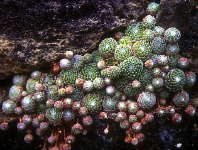 Their natural habitats are typically 3000 - 8000 ft above sea level in mountainous regions of central and southern Europe and Mediterranean islands. 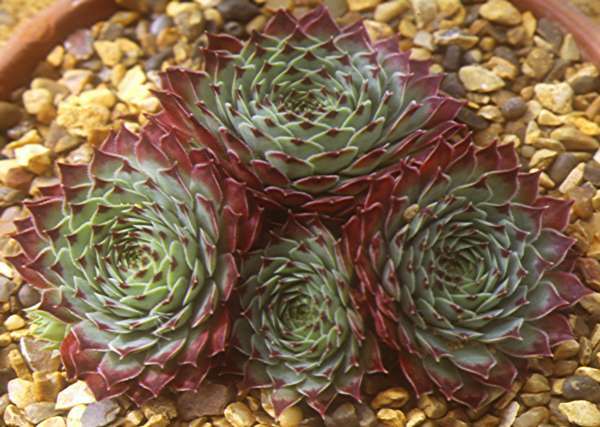 There are around 50 species and over 3000 named cultivars with a wide range of rosette sizes, forms and colours. 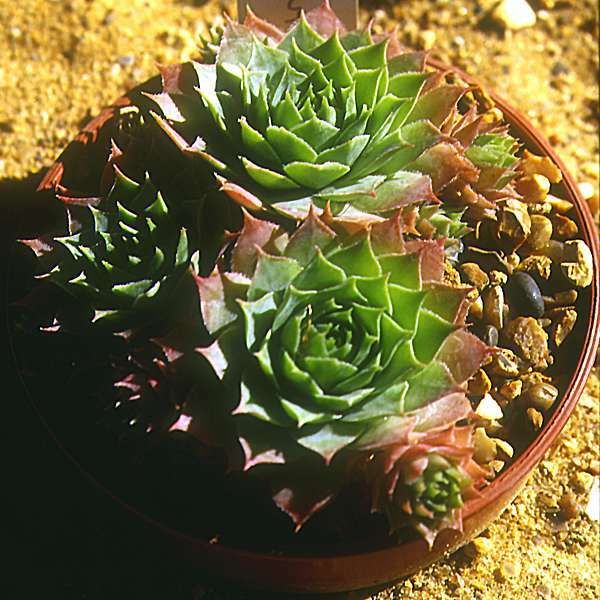 Sempervivums have star-shaped flowers with 8 - 16 petals (right), typically in pink or red although a few species have pale-yellow flowers. 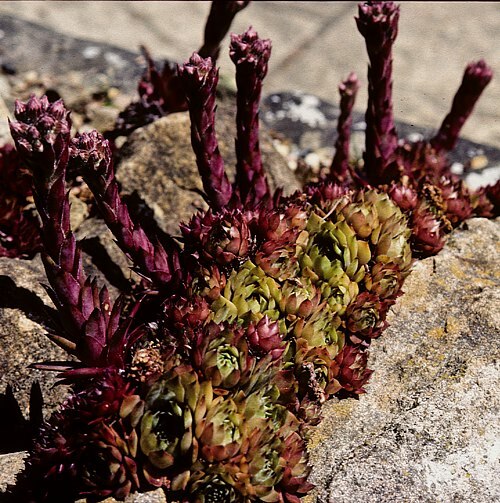 A clump of Sempervivum rosettes adds an exotic touch to any sunny garden. 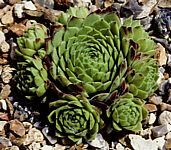 Sempervivums are related to Jovibarba and Rosularia, choicer and less hardy genera often grown in a cold frame by alpine plant enthusiasts and mainly distinguished from Sempervivum by their flowers. 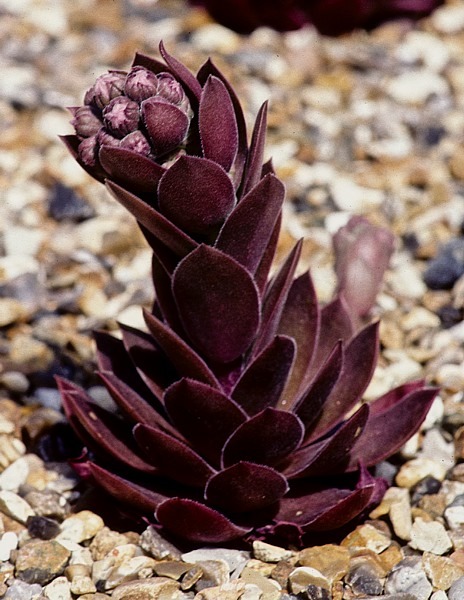 Jovibarba: All five species of have bell-shaped flowers, usually with six pale-yellow petals. 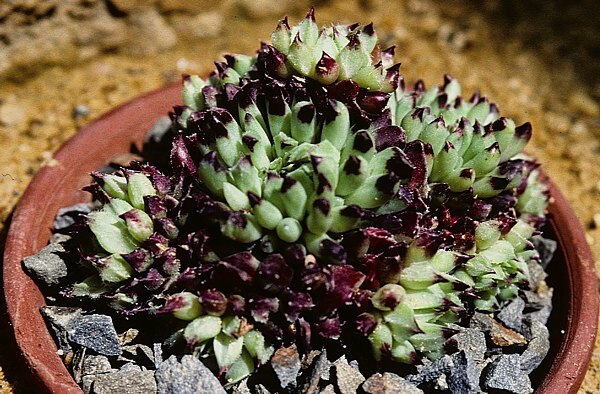 Prometheum: Eight species of annual to perennial compact rosulate succulent plants formerly included under Rosularia. 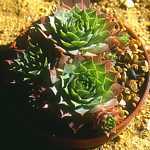 There is a tap root but no caudex. 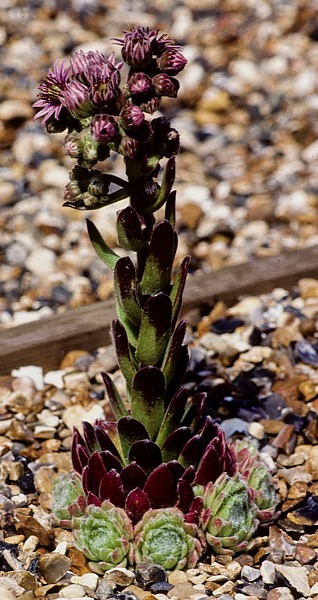 The fleshy leaves are pubescent but leaf margins are not cilliate. 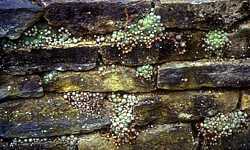 The inflorescence is cymose rather than paniculate. 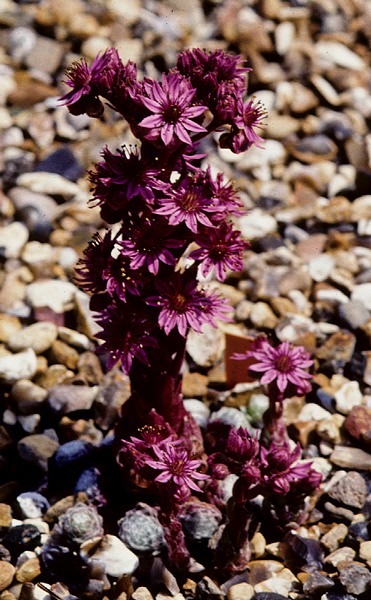 Native to mountains of Greece, Turkey to Northern Iran. 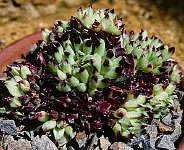 Rosularia: Twenty-five species have been described, from Morocco to the Himalayan region of China. 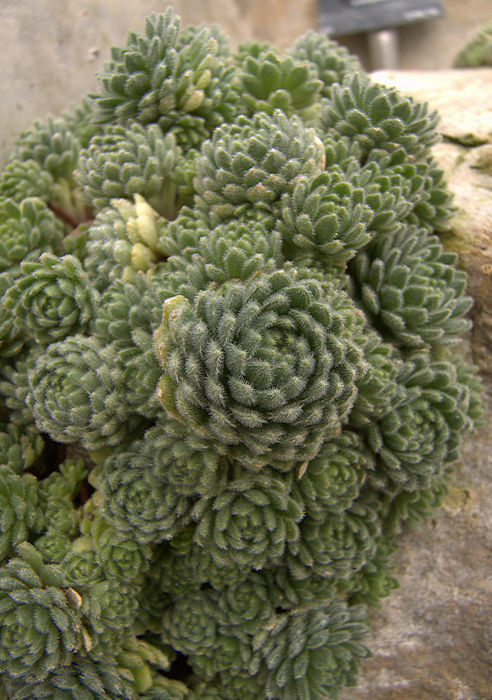 The small, clumping, succulent rosettes produce pale-yellow flowers with 6 - 8 petals. 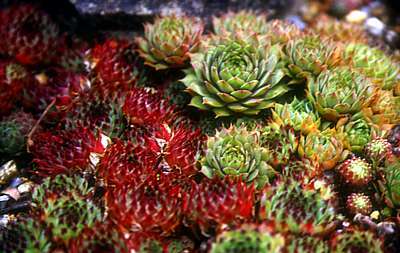 Sempervivums are available in many forms and colours, green through browns, yellow, orange, pink and red although they need to be grown in full sun to fully exhibit the different colours. 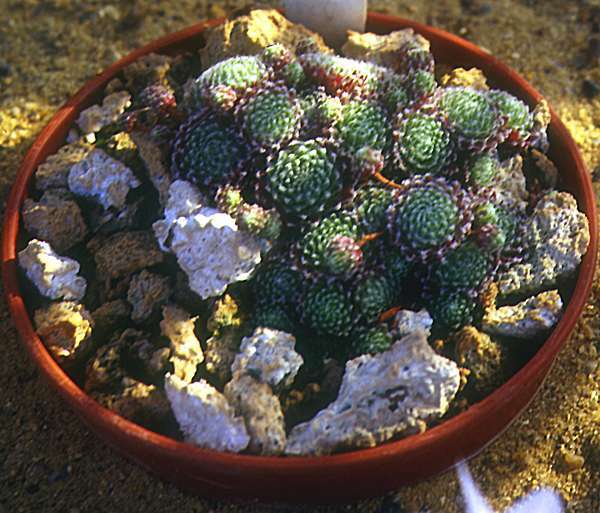 Out of full sun many cultivars tend to end up as a similar green colour. 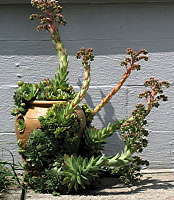 Leaves may be glossy or matt, in some cases with a waxy bloom or with downy hairs. 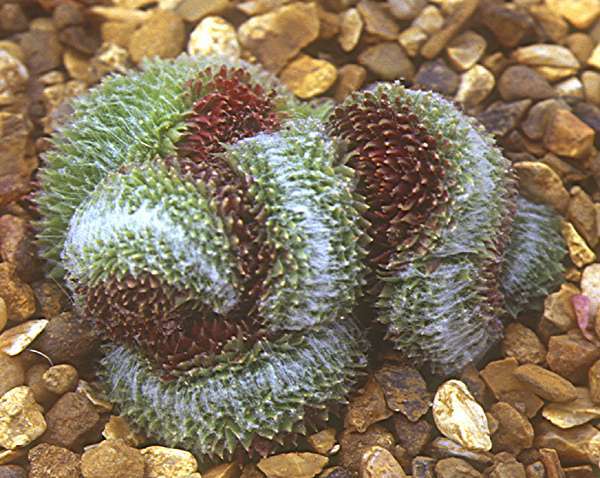 Mature rosettes can be from half an inch to 6 inches in diameter and some species/cultivars have hairy rosettes. 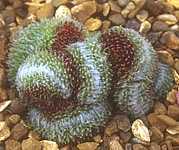 Small silver-coloured hairs may occur along leaf margins with a more pronounced clump of hairs at the leaf tip. 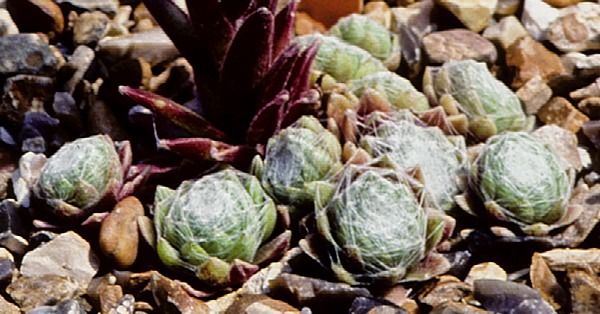 In some cultivars these hairs are long enough to produce a pronounced cobweb effect. 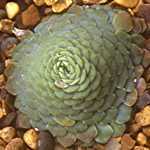 The numerous forms available is one of the main attractions of a collection of Sempervivums. 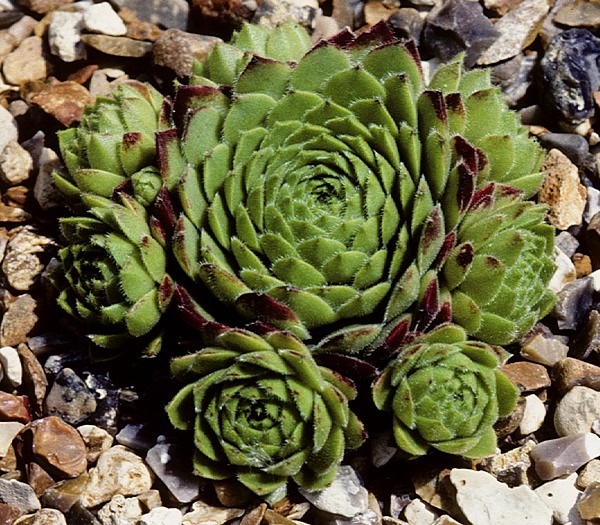 Traditional Uses: Sempervivums were considered sacred to Jupiter in Roman and Thor in Nordic mythology. 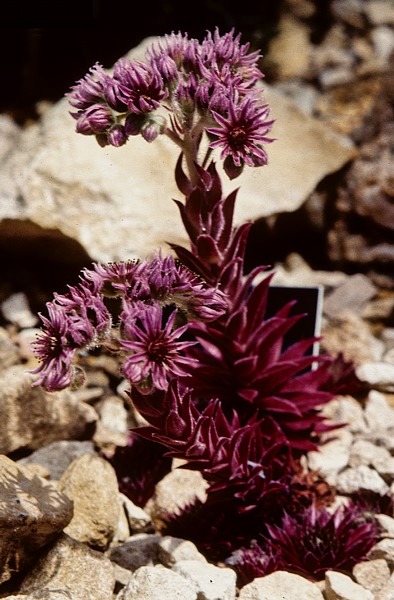 The flower was said to resemble the beard of the God. 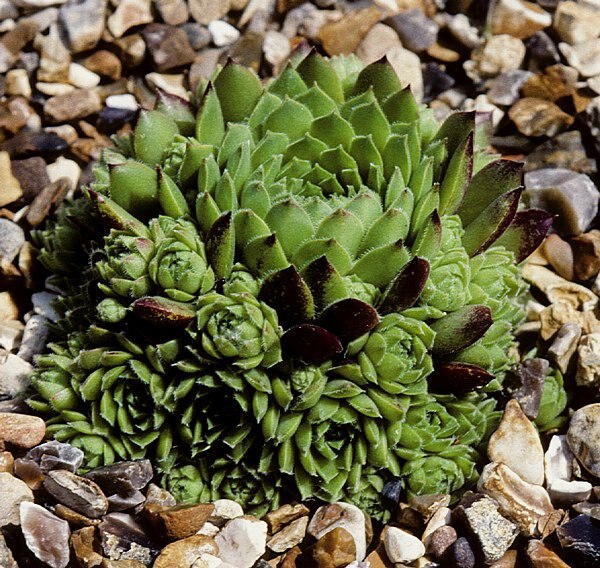 In some places Sempervivums are traditionally grown on roofs between thatching, tiles or timber. In ancient times, this was thought to guard against thunderbolts, storms and sorcery and ensure the prosperity of the occupants. Perhaps corona discharge from the pointed leaves could reduce the local electrical field strength and thus the chance of a direct lightning stroke. 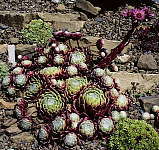 A firm in Germany exports Sempervivums as rolled up carpets of roofing material, exhibited at the 2003 Chelsea Flower Show. Cultivation: Most Sempervivums are quite frost resistant and very easy to grow outside in rock gardens, planters and troughs. 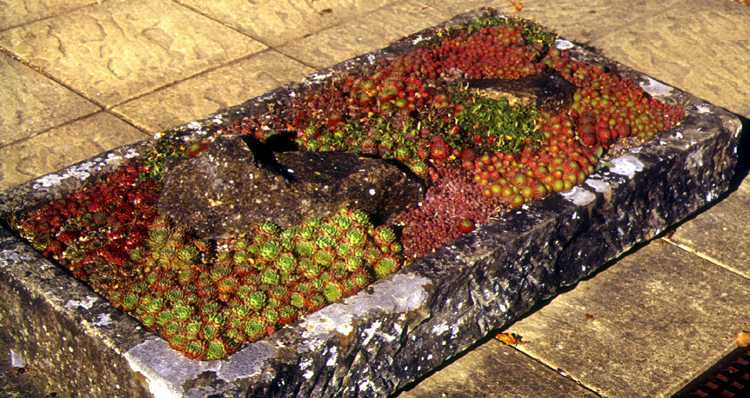 A tray or planter of different coloured Sempervivums can look very decorative and of course has the advantage of not taking up indoor growing space. 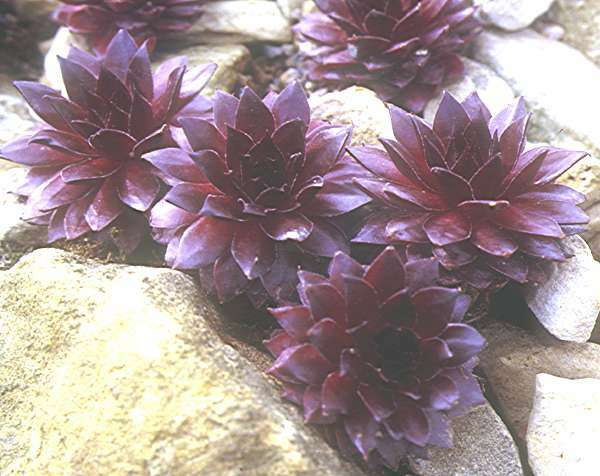 Sempervivums also do well in cracks in dry stone walls, on tufa and in rock gardens. 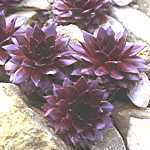 They dislike damp conditions and prefer full sun, but are otherwise undemanding. They should be planted in a shallow gritty, free-draining compost incorporating 25 - 50 percent sharp sand and grit, with a top dressing of grit between plants. 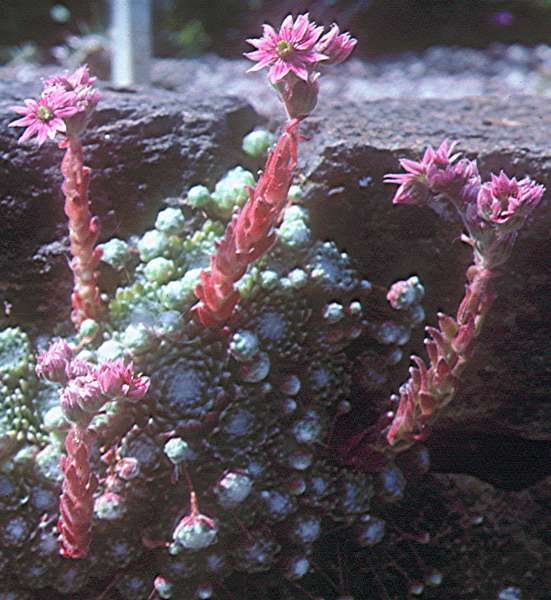 The only snag with Sempervivum plantings is that this genus is monocarpic i.e. 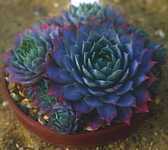 each rosette can only ever flower once and then dies. 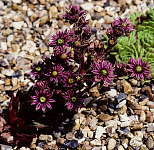 The dead plant leaves a hole in a clump, which could be a problem with a roof carpet. 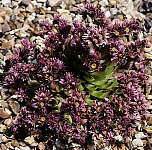 The dead rosette should be carefully removed and the hole filled with gritty compost. 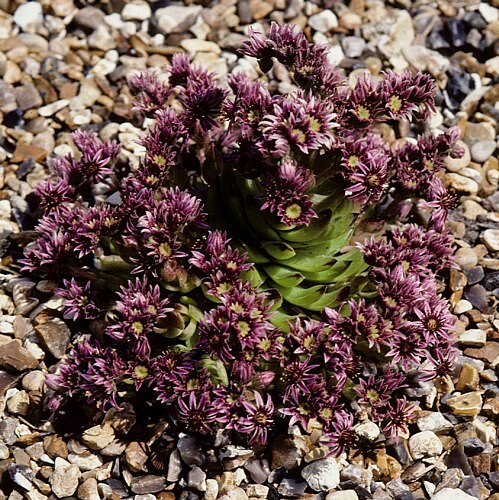 Most species / cultivars produce lots of offsets which usually make up for any losses after flowering. Rosularias may rest in mid-summer. 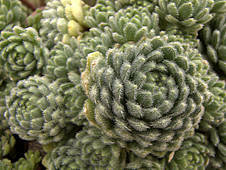 Sempervivums will usually survive outside in climates with cold, wet winters such as that of the United Kingdom, although some of the hairy Sempervivum cultivars, Jovibarba and Rosularia will appreciate shelter from the winter rain. 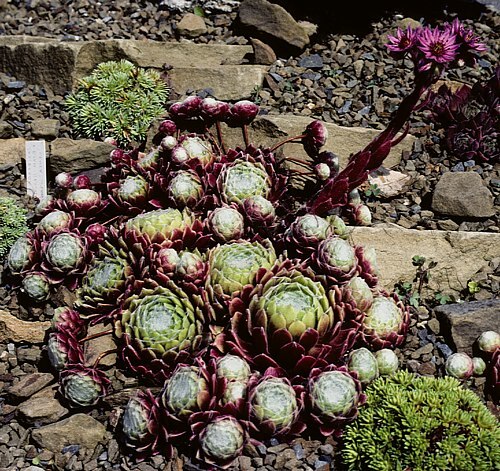 Alpine enthusiasts sometimes suspend a small pane of glass over delicate cultivars. The top half of a clear plastic bottle can be adapted to provide a similar function. 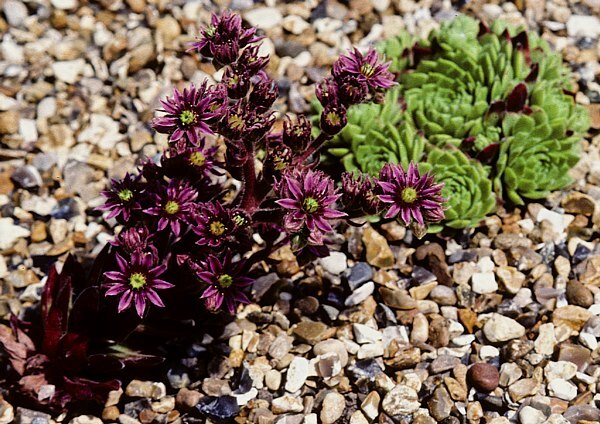 Alternatively, delicate or rare plants can be potted up and overwintered in a cool greenhouse or cold frame. 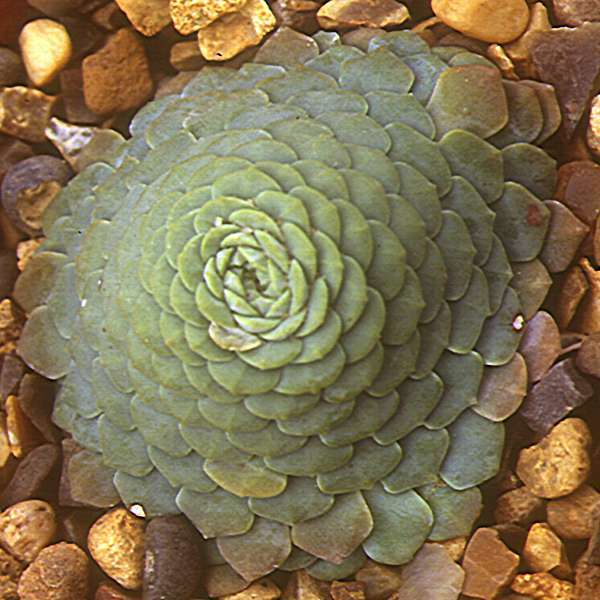 Propagation: Sempervivums reproduce vegetatively by offsetting around the base of the rosette, often forming a dense cushion. 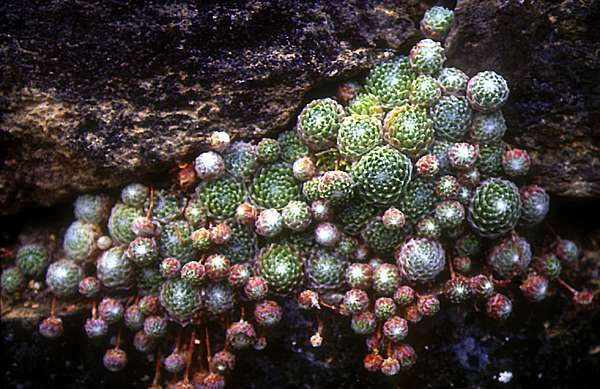 Each offset will develop roots of its own and become independent of the parent plant as the connecting stolon withers. 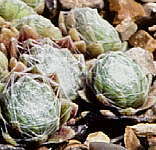 Some Sempervivums produce offsets on the end of long stolons and these root down at a distance from the parent plant, rather than producing a dense clump. 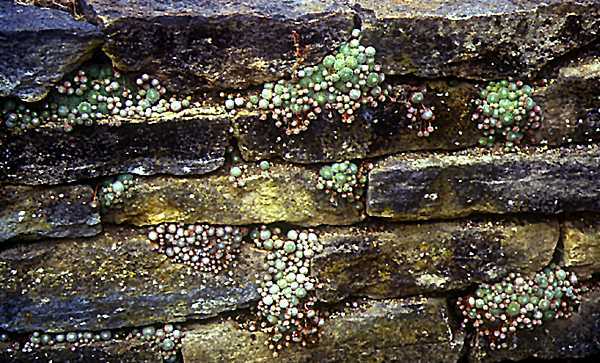 Offsets can be removed when root development has begun and grown on separately as a method of propagation. 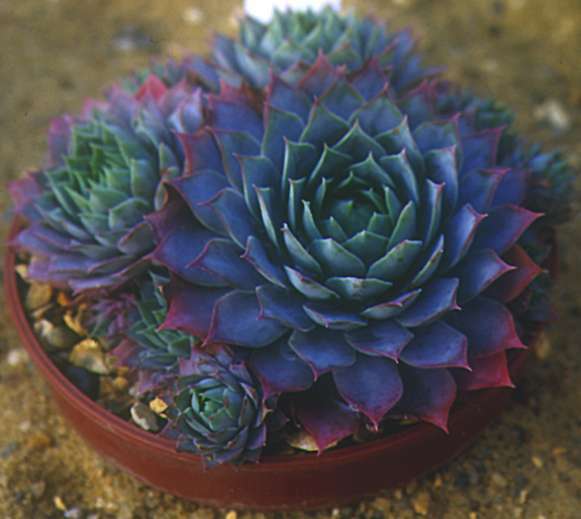 This method preserves the characteristics of a named cultivar, which will not come true from seed. 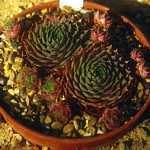 The stolon should be cut off just below the base of the offset to encourage roots to develop from the base of the rosette. 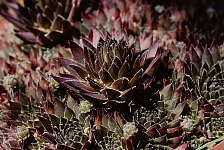 Sempervivum flowers often produce a star-shaped fruit containing fertile seeds which can be easily be collected and grown. The fruit should be allowed to dry, crushed and the debris sieved to separate the seed. 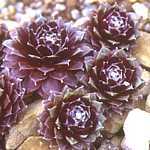 Stratification after sowing by chilling in the fridge at 4 deg C for a few weeks, or outdoors during the winter, will greatly enhance germination. 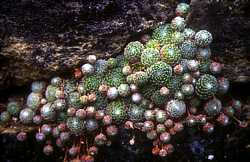 As hybridization is very common, seedlings are unlikely to breed true to type. 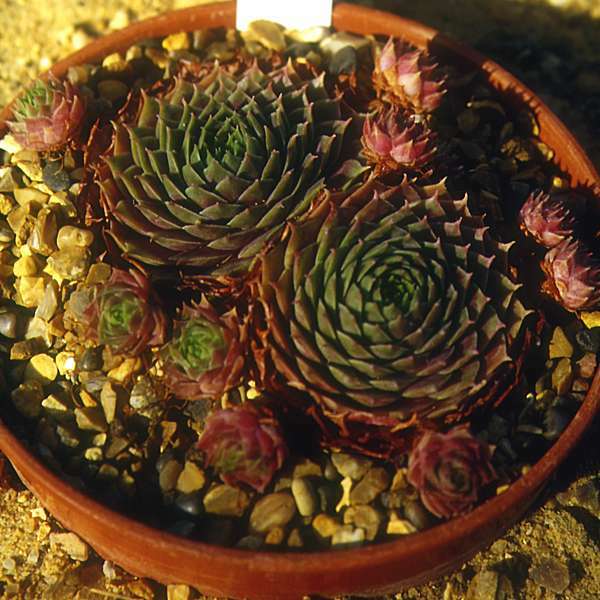 However, this provides an opportunity to look for new and unusual forms among the progeny.